Business: Our goal is to make homes more energy efficient. We do that with home inspections. We start by doing all the preliminary work so the builder can pull the building permit. We do a framing and insulation inspection before drywall, then go back to do HVAC testing. When the home is move-in ready, we go back and do whole-house testing, which is done by doing a blower door test—that’s measuring the infiltration rate of the home. My business is six years old. Background: I was born and raised in Rockwell City, Iowa. I went to Iowa Lakes Community College and then Iowa State. 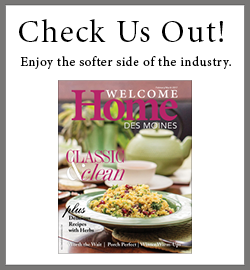 I built and framed homes and went into the energy efficiency business when I moved to the Des Moines metro area. I saw that there were businesses doing this type of work, so there was a niche where a person could get involved in it and make a good living. I already had the experience of seeing how homes were being insulated and constructed. Notable achievements: Since 2008 to the present, we have received the ENERGY STAR for Homes Leadership in Housing award. Why I love what I do: It’s a necessity for sustaining the economics for houses—that’s what it basically boils down to. It makes for better quality craftsmanship of homes. Skill I’ve developed most on the job: Probably customer service. Meeting the needs of what has to be done to further yourself in the industry. What people should know about the energy efficiency field: There are rebates. There are tax credits. There are all kinds of things you can benefit from if you construct your home properly. How I give back to the community: We have built Habitat for Humanity houses. We’re doing a house with the building trades class at Dallas Center-Grimes High School. We’re also providing our services to a nonprofit charity organization. We give to the youth baseball programs in Grimes. We try to do a lot of giving back. How I get away from work: I like to hunt. The most significant recent change in the energy efficiency industry is: The 2012 International Energy Conservation Code, regarding the construction of homes. There are 17 whole pages of energy performance changes just for home builders.